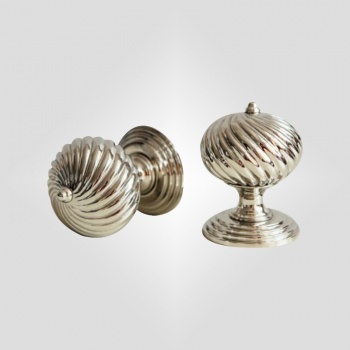 A classical door knob from the Edwardian period, part of our traditional door furniture range with a beautiful swirl pattern that runs around the entire knob. Each knob is secured with a concealed fixing hidden beneath the rose which is stepped inside - this helps maintain its elegant lines. The knobs and roses are both cast in brass and nickel plated.